I truly enjoy painting Marin landscapes. I try to capture on canvas the wonderful forms of the mountains I am familiar with. I use the colors of the sunlight on the hills and contrast them with the deep early morning or late afternoon shadows. I graduated from Punahou High School in Hawaii, and Mills College in Oakland; later I studied art with Tom Buchanan, Kent Rupp, Fred Reichman, Chester Arnold, Carol Levy, Wally Hedrick, Ted Greer and Jack Scott at the College of Marin. 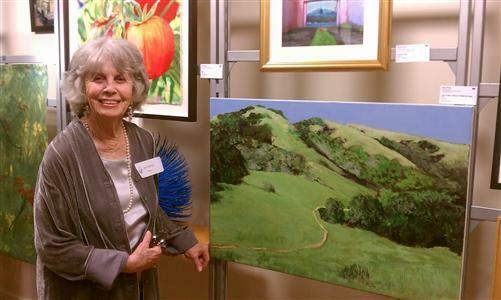 I have had my art shown in the San Francisco Arts Festival, at College of Marin, Marin Society of Artists Gallery, various restaurants in Marin, at Marinscapes, the Marin Lagoon Show, the California Collectors' Gallery, Marin County Fair, Down Town Art Center, with Indian Valley Artists, now known as the Marin Museum of Contemporary Art, Marin Community Foundation Show, The Tamalpais, Art League of Northern California and National League of American Pen Women. I have lived in Marin County since 1959; I have 3 grown children, 7 grandchildren and a horse.